NEVER EVER CLOSE THE SIDEBAR! I made the mistake today of closing the last item in my sidebar (the Drop Stack). This caused the sidebar to disappear, and I can't figure out how to open it again. This is exactly what I want, but it no longer exists. See screenshot. There is also talk of a little gear icon, but I believe it's in the sidebar, and I don't have a sidebar. I'm pretty sure I have to reinstall PF to restore the sidebar. I would love to be wrong about this. Can anyone at Cocoatech or here help me? 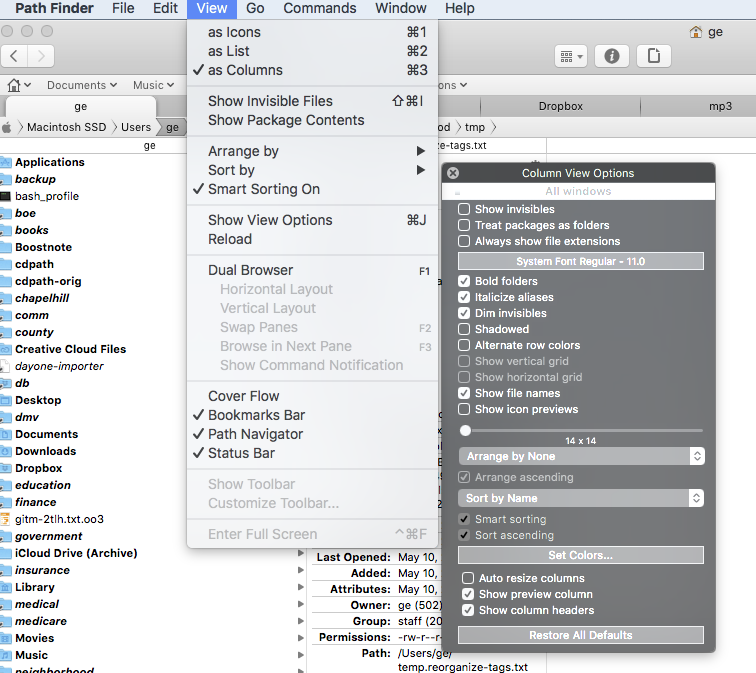 Please use Window > Modules and drag Sidebar module into your Path Finder window. Feel free to write us back and we will be happy to assist you. Path Finder Support Team closed this discussion on 15 Oct, 2018 01:00 PM. Yes that worked. Very unintuitive but it worked. Thanks for the quick response. Path Finder Support Team closed this discussion on 16 Oct, 2018 10:20 AM.